Squabbles over places is troubling, but the real disaster at the new Riverdell Farmers Market is the poisoning of the unpopular poultry agent, which Penny Weaver and her sidekick Sammie set out to solve before the state closes them down. Review: Farm Fresh and Fatal features an appealing protagonist, an intriguing background, and well-realized characters. Readers will enjoy these characters and empathize with their successes and failures. In the tradition of Margaret Maron. - Carolyn Hart, author of Dead, White, and Blue. 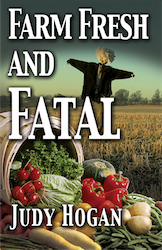 To buy a signed copy of Farm Fresh and Fatal ($17 pick up, $20 shipped - tax included), mail a check to Judy Hogan, PO Box 253, Moncure, NC 27559-0253. If you want to be on Judy’s book news email list contact Judy at judyhogan@mindspring.com.